In last week’s WIN eNews, we announced 5 of the Top 10 stories — numbers 6 to 10 — that happened during the 2012-13 season. The following completes that list with the top 5 moments. 1. Kyle Dake beats David Taylor three times to clinch Hodge Trophy and set NCAA record — The 2013 NCAA Division I tournament in Des Moines, Iowa, featured ten wrestlers who had already won individual championships, including six who were competing at three different weight classes: the most notable coming at 165 pounds where Cornell’s Kyle Dake defeated Penn State’s David Taylor. Kyle Dake’s ability to ride David Taylor allowed the four-time NCAA champ to beat the 2012 Hodge Trophy winner three times during the 2012-13 season. That victory — Dake’s third after also beating the 2012 Hodge Trophy winner at the NWCA All-Star Classic in November and the Southern Scuffle in January — also also sealed Dake’s historic fourth NCAA title. He became just the third wrestler to win four individual championships — joining Oklahoma State’s Pat Smith and Iowa State’s Cael Sanderson (who was in Taylor’s corner) — and the first wrestler to win four titles at four different weight classes (also winning at 141 in 2010, at 149 in 2011 and at 157 in 2012). Dake, who completed his career with a 137-4 record and 79-match winning streak, was named the winner of the WIN Magazine/Culture House Dan Hodge Trophy, presented by ASICS. 2. Penn State wins third straight title in talented field — Penn State became just the third NCAA Division I program to win three straight team titles as the Nittany Lions also left Des Moines, Iowa, with five All-Americans. Oddly, all five were finalists: 125-pound Nico Megaludis, 165-pound David Taylor, 174-pound Matt Brown, 184-pound Ed Ruth and 197-pound Quentin Wright. Only Ruth and Wright won titles for coach Cael Sanderson, whose return to Iowa was a homecoming for the former national champ from Iowa State, which hosted the 2013 Nationals. Wright clinched the team title after the lone senior defeated 2011 NCAA champ Dustin Kilgore, 8-6, for his second national title and fourth All-American honor. Finishing second was Oklahoma State with seven All-Americans — including champions Jordan Oliver (149) and Chris Perry (174) — and Minnesota was in third with an NCAA-high eight All-Americans, led by two-time heavyweight champion Anthony Nelson. 3. Iowa beats Penn State in dual — The top-ranked Nittany Lions entered Carver-Hawkeye Arena in Iowa City with a 20-dual winning streak. It ended there as the Hawkeyes, ranked No. 3, defeated the Lions, 22-16, before a sold-out crowd of 15,077 fans. The critical match came at 174 pounds where Mike Evans, a native of Pennsylvania, countered a shot by Matt Brown to win 4-3 to give Iowa a 19-9 lead. Iowa’s Mike Evans (right) was nearly taken down before he corrected his base and eventually defeated Penn State’s Matt Brown in their 174-pound bout in Iowa City on Feb. 1. 4. Conference Realignment Continues — The sport of wrestling did not start the changing of conference affiliations for Division I schools, but the many moves did have an effect on the state of wrestling. That was never more true than in the Mid-American Conference, where former Big 12 member Missouri — forced to compete in the MAC after the school joined the wrestling-less SEC — won its first MAC championship and ended Central Michigan’s decade-long run as team champs. Overall, the MAC (which also included another transfer in Northern Iowa) sent 40 wrestlers to Des Moines in 2013, compared to 25 who competed in St. Louis in 2012. Another school which will compete in the MAC next year is Old Dominion, formerly of the Colonial Athletic Association (CAA), which will no longer exist after fellow CAA members Binghamton, Boston U., Drexel and Hofstra announced they would compete in the EIWA. (It may be the only year for Boston in the EIWA after the Terrier administration announced it was dropping wrestling after the 2013-14 season.) Meanwhile, George Mason and Rider will wrestle in the Eastern Wrestling League. The EWL also will look different in the future after West Virginia first left to compete this past season in the Big 12, while former “Backyard Brawl”-rival Pittsburgh will wrestle next winter in the Atlantic Coast Conference. Even more changes will happen in the future as Maryland of the ACC and Rutgers of the EIWA join the Big Ten … while it appears the remaining teams in the Big 12, Pac 12 and Western Wrestling Conference could compete together in an NCAA-qualifying Western Regional in 2014. 5. Minnesota wins National Duals at home — The ever-changing NWCA National Duals took on a different look in 2012-13 as Minnesota — the winner of the 2012 Duals — earned the right to host eight teams in Williams Arena, Feb. 22-23. And for a second consecutive year, the Gophers defeated Oklahoma State — forced to win one of four regionals the week before — on the strength of pins by Logan Storley over Chris Perry and heavyweight Anthony Nelson over Alan Gelogaev. 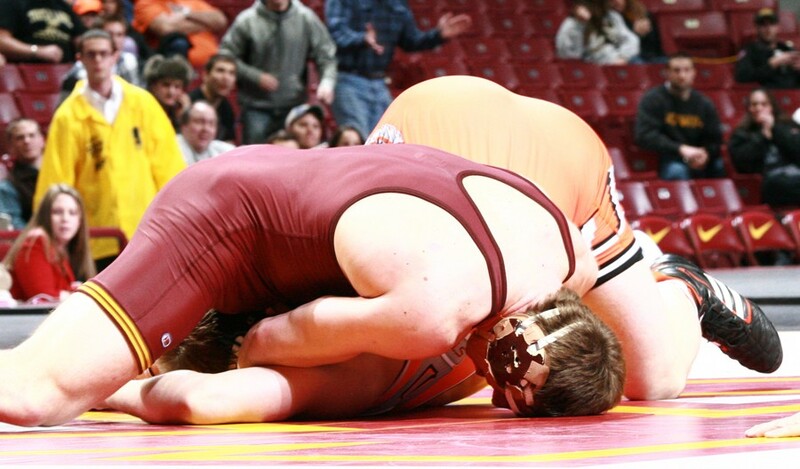 Minnesota heavyweight Anthony Nelson pinned Oklahoma State’s Alan Gelogaev as the Gophers won a second straight NWCA National Duals championship. Meanwhile, Missouri finished third with an 18-16 win over Iowa as two Tigers — Alan Waters (125) and Kyle Bradley (157) — upset a pair of top-ranked Hawkeyes, Matt McDonough and Derek St. John, respectively. 6. NWCA All-Star Classic packs house in D.C. — The 47th annual National Wrestling Coaches Association All-Star Classic packed the gymnasium in American University’s Bender Arena, Nov. 3, in Washington D.C … primarily because NCAA champions Kyle Dake of Cornell and David Taylor of Penn State agreed to face each other in an exhibition. And while the final results did not affect the wrestlers’ records or NCAA seeding, Dake did win in a 2-1 tiebreaker in their 165-pound match. Meanwhile, two eventual NCAA champions lost that night: 125-pound Jesse Delgado (Illinois) who lost to Penn State’s Nico Megaludis, 4-3; and 197-pound Quentin Wright (Penn State), who was pinned by Pitt’s Matt Wilps with ten seconds left in the match. 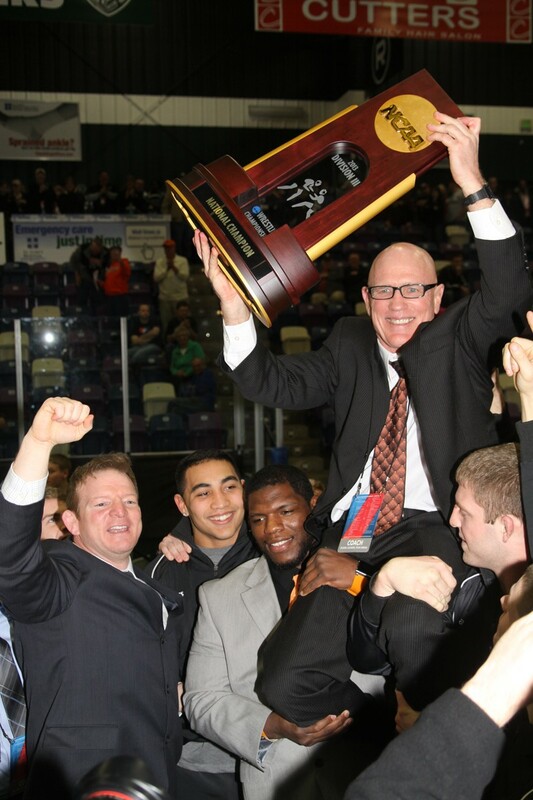 Wartburg coach Jim Miller was all smiles as he hoisted the 2013 NCAA Division III team trophy after the 59-year-old coach was hoisted on the shoulders of his final Wartburg team. 7. Wartburg’s Jim Miller retires with tenth NCAA title — The NCAA Division III school from Waverly, Iowa, made sure their retiring coach went out on top, literally. Knight wrestlers carried coach Jim Miller on their shoulders to receive the tenth team trophy earned by his wrestlers since he took over the program in 1991. 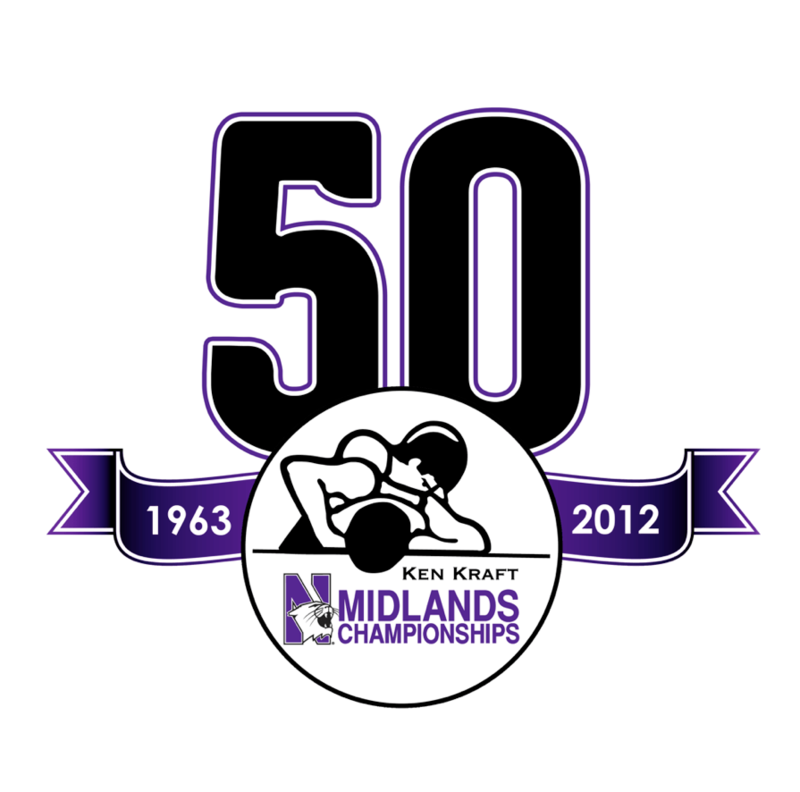 But when it came to winning this coveted tenth championship — pulling within one of Augsburg’s Division III record of 11 titles — there was nothing to worry about for Miller and his ten wrestlers who collected seven All-American honors while completing a third straight team title and fifth of the last six years. 8. Illinois edges Virginia Tech in 50th Midlands — The legendary tournament celebrated a half-century of existence in Evanston, Ill., on Dec. 29-30 … and Illinois and Virginia Tech made sure it would be memorable as the Illini topped the Hokies by just a two-point margin (99.5-97.5) in the final standings. Oddly, Illinois did not feature a champion, but did see five wrestlers earn placements in the longest-running regular-season tournament. Virginia Tech, meanwhile, saw two wrestlers, Jarrod Garnett at 125 and Nick Brascetta at 149, win individual titles with Garnett’s win coming in sudden victory over eventual NCAA champion Jesse Delgado. 9. College wrestling comes to Madison Square Garden — Like many college sports in this country, wrestling has strong roots in the East … considering the Eastern Intercollegiate Wrestling Association’s post-season tournament is older than the NCAA’s annual event. Among the more notable dual matches of top teams, Oklahoma State defeated Cornell, 21-16. Tyrell Fortune (right) of Grand Canyon won a NCAA Division II championship one year after the native of Oregon won two NJCAA titles. 10. Grand Canyon’s Tyrell Fortune named Div. II Wrestler of the Year — With the 2013 NCAA Division II Nationals being held in a state lacking a college wrestling program, Alabama. The wrestling event was part of the NCAA’s Division II Winter Sports Festival in Birmingham, March 8-9. Possibly the most notable match of the tourney, Grand Canyon’s heavyweight Tyrell Fortune defeated two-time champion Matt Meuleners of Northern State in the finals. But that victory — which capped off a season that saw the junior win 37 of 38 matches and 20 by fall — helped the native of Portland, Ore., and two-time NJCAA champion from Clackamas Community College earn the highest honor presented by the National Wrestling Coaches Association as the Division II Wrestler of the Year. Fortune is the sixth recipient of the award, voted on by eight coaches from around the country. The Region IV representative edged St. Cloud State senior and Region III Wrestler of the Year Shamus O’Grady by one point for the top honor.